My journey through A Textile Vocabulary has taken longer than I hoped. A year and three months since I started and like everyone studying part-time and distance learning there has been occasions when life has taken over and the studies have had to take a back seat. However they are never far from my mind and I enjoy working on my ideas whether it is theoretically or practically. I started out as a total beginner not even having much practical skills as far as sewing or other hand crafts are concerned and as well as doing the coursework I am constantly studying and researching techniques. During this final assignment I have enjoyed the freedom of being able to produce developmental work with a more open, less restrictive approach to the themes. I have also enjoyed researching designers work that I find interesting and I am starting to see work I find inspiring and engaging in haute couture when it was not something I had considered before. One of the hardest things about this collection was not trying too many different techniques. My head was full of ideas I would have liked to create but I didn’t necessarily have the skills to produce them and if I had taken the time to teach myself all of them I would never have finished. I liked the idea of creating a Nuno felted piece and a freeform crocheted and knitted piece but I have neither of these skills. For my collection I experimented with a few ideas using heat manipulation. I tried techniques using a heat gun and steam. Using different items and wrapping them or using them to sculpt the fabric. Some of these were more successful than others. The light chiffon fabrics respond very quickly to the heat and make some great shapes which also produce interesting shadows when light is reflected through them. I would like to spend more time on this and would love to try techniques like Iris van Herpen used creating her ‘Water Dress’ where she melted a clear plastic and sculpted it. Reflecting on the work I have completed for this assignment I am content I have improved since starting ATV. I am becoming more comfortable experimenting with materials and techniques and I feel my ability to design and use composition has developed significantly because of it. My observation skills and visual awareness has always been a strength but I feel this is developing with every exercise and the constant research. I think I have effectively applied my skills and knowledge to present my work in a coherent manner. This collection was rather bulky and adding my other project work and sketch book resulted in me having to send two parcels to my tutor. I hope my sketchbook effectively communicates my ideas. I feel I am still guilty of making leaps in my imagination and not demonstrating these ideas on paper. However I hope it is still possible to see my thought process with the work I have submitted. I feel this is probably one of my strengths. My imagination is always thinking up ideas and I enjoy experimenting. However my basic skill set can’t always keep up but I am continually looking to learn new techniques and I am interested in all the new technology and what that could possibly mean for Textiles in the future. My personal voice is probably not that well established yet. I think I joined the course thinking I would like to create art quilts but with the continuing research I have looked at so many exciting ways of working I feel a bit like the proverbial child in a sweetie shop wanting to try everything. However I need to remind myself of time constraints otherwise nothing would ever get handed in. I feel through the development of my work I have continually reflected on it, following up with more research and reworking. I am always critical of my own work but I feel I am able to use this in a constructive way now. My confidence is improving and rather than being plagued by self doubt if something isn’t working I move on or make changes till I am more satisfied. In this final assignment we are asked to reflect on the samples we have produced and consider the supporting work from the first two projects. My capsule collection is based on the Nature’s Larder theme first explored in the Introductory project at the very start of ATV, however I have focussed on the marine environment this time. Looking at seaweeds and mussels. During my research I was very drawn to textiles produced using unusual materials or those that were manipulated into unusual shapes. These fitted my initial ideas for producing a collection with texture and colour. I wanted the pieces that reflected seaweeds to also reflect movement as if you were viewing them underwater. During my sampling experiments I was excited by the shapes that could be produced by manipulating the fabrics with heat either through use of a heat gun or steam. I also wanted to see if I could produce a piece of seaweed inspired lace through free-embroidery which is another new skill I’m experimenting with. I wrapped mussel shells into the fabric and steamed it. I then hand painted to produce the detailing. I was quite pleased with this piece. I linoprinted a design and then drew it on soluble stabiliser which I then free embroidered. I didn’t dry this totally flat as I did with the test piece, this allowed it to dry in a curly and crinkly way. Before the stabiliser was rinsed away. I was pleased with the way this turned out, but if I was doing this again I would maybe make the design larger as it shrinks when you wash out the stabiliser especially if you don’t dry it flat. I would also consider doing this again on chiffon or a similar fabric. Heat manipulated fabrics with a heat gun and sewn together. I wanted to give the impression of seaweeds under the water. I’m not as happy with this piece. I was most excited with the grey chiffon as I loved the shapes and shadows created by the heat manipulation. I feel I may have tried to do too much by adding several types of fabric. This was made by manipulating clear PVC with a heat gun. I folded and sculpted the fabric as I used the gun. I coloured it with spray PVC dye after a failed attempt at painting with acrylics. I sewed the strips together to create the impression of fronds hanging together. A mixture of fabric that was wrapped around beads and steamed and crocheted chains which were stitched to a stretchy mesh that made me think of fishing net. This worked well, I think the mixture of fabrics worked together. The interesting textures complemented one another. In this project we are required to translate qualities from our drawings into material and stitch explorations and further develop the textile and yarn concepts produced in Project 2. This worked fairly well, the printer skipped a little and the colours were slightly different from the original drawing. Printed photo onto textile paper, fixed to jersey material and stitched. Thread and material scraps that have been sandwiched between soluble stabiliser and over stitched. Heat manipulated fabric and then stitched. Quilted shell shapes and then hand stitched detail. Wrapped and tied fabrics then steamed. Various knotted and crocheted linear forms. Tubular crochet forms, created with wire and stitching. Using my drawings from Project 1 I developed the following textile concepts. Layered papers with stitch. Torn and crumpled papers. Layered papers and foam with paint and pen. 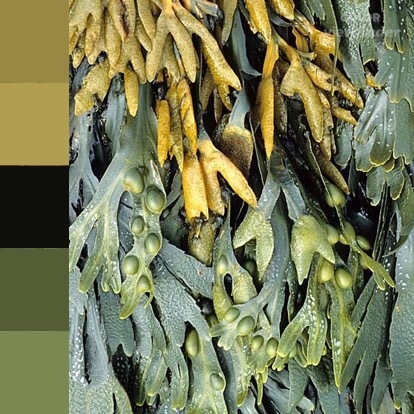 Following my development of drawings I have chosen these colour palettes inspired by photos and drawings from the marine environment. I want to hold my hand up to being guilty of not paying much attention to fashion in the past. I always felt very removed from the culture of trends and catwalk collections. Clothing for me was about practicalities and what was available although I always veered to more unusual looks if I was exposed to them. Now having the internet we are exposed to so much information it’s possible to find designers that appeal to you or watch catwalk shows of the latest or past collections and even to see some of the processes involved in creating them. During my research of these, MacQueen’s work really stood out to me. As I have said knowing nothing about him I did research only to discover sadly he is no longer here and that we shared a birthday. I also discovered he was fascinated by his Scottish heritage and his ancestors belonged to an area of Skye where my own came from. I think his work was particularly inspiring as he broke boundaries producing his collections. You can see the commitment to the theme he is trying to convey. His catwalk shows were more like performance art and the outfits often made from unusual materials which produced reactions of shock and awe. He was certainly a master of his craft. I am particularly drawn to the work created for his Voss Spring/Summer 2001 collection, the colours in the green outfits, the razorshell dress and the outfits made with mussel shells. Other things were the embroidery, the asymmetric cuts and the use of unusual materials as in the red microscope slide dress. Iris van Herpen is a Dutch fashion designer. Since her first show in 2007 she has continued to investigate and invent new ways of combining traditional and radical materials within her garment construction producing futuristic looking forms. Van Herpen innovative approach has included the use of 3D printing as a garment construction technique and her work is almost a form of sculpture. In terms of research for this project I was particularly drawn to her ‘Water Dress’. For this piece she collaborated with Nick Knight who captured high speed footage of model Daphne Guinness being splashed with black and clear water. She then chose her final idea from one of the many images and heated and sculpted plastic to produce the dress. I reviewed my visual research from the Introduction and Parts 1 and 2 and other ideas and sketches made during the process of the course. My strengths lie in my more detailed observational drawings and I feel my concept drawings of ideas are a weakness. I find it difficult to convey my ideas from my head to the paper, I expect I lack confidence in this as looking back these sketches tend to be very small. I have chosen to go with Option 1 Strengthening a theme. This involves going back to look at Part 1 The Introductory Project. My choice of theme for this was ‘Nature’s Larder’. As we are not constrained to producing just a still-life composition from household objects like we did initially I wanted to strengthen and develop this theme by thinking more about Nature’s Larder and what that meant to me. My development features a lot of investigation into the sea. Here are some of my drawings. I am returning to my studies after a break. I had to take some time off to deal with some personal events and although this course has never been far from my mind. I feel the time has flown by and I need to now make more time for me to continue with my studies. Before this time out I had actually completed and submitted Part 4 of my practical work but still have to update my blog with my processes. I have decided to leave this for now and complete part 5 and will return to it again. This statement makes me feel excited I relish experimenting and although for someone like me as a total beginner everything is an experiment I think Ofili’s approach is how the creative approach works. For me I have lots of ideas, then I spend quite a lot of time reflecting on them and trying to work out how I might achieve them. When I have more refined ideas I research materials and processes and then I will experiment to see how these ideas work out. So on reflection, for me not everything is experimenting there is a lot of thinking and reflection beforehand. Thinking of an exhibition, or in our case the submission of work, as a result of the experiment rather than a conclusion makes me think it is possible that at that moment in time it is a conclusion. When you have an outcome in my mind and have achieved it that is a conclusion but I can also understand how that could be seen as a result that at some time in the future you may rework or develop into a new work. Although we are not required to present textiles in a final form I do think you can’t help visualising your work if it was developed further.